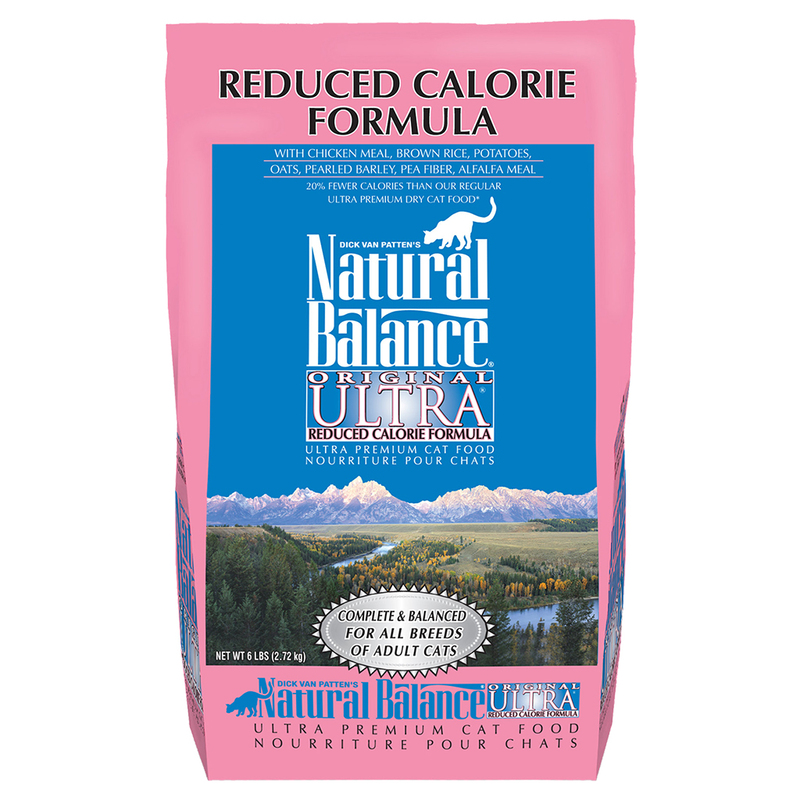 Keep your kitty healthy and fit with the Natural Balance Original Ultra Reduced Calorie Formula Dry Cat Food. It’s made with 20% fewer calories to help support an ideal weight for your pal, without skimping on the protein and nutrients he needs to fuel all his adventures. That’s why every crunchy bite is loaded with lean proteins like chicken, salmon and lamb, plus wholesome brown rice and barley, and vitamins, minerals and essential taurine for healthy eyes and heart. With every bowl, you’ll be doing your part to help your pal look and feel his best with nutrition he can taste. Lower calorie kibble is formulated with 20% fewer calories to support a healthy weight for your kitty. Made with high-quality proteins with chicken meal as the first ingredient, plus salmon and lamb to support active muscles. Chicken Meal, Chicken, Brown Rice, Potatoes, Pea Protein, Oat Groats, Barley, Pea Fiber, Dehydrated Alfalfa Meal, Chicken Fat (Preserved with Mixed Tocopherols And Lactic Acid), Natural Flavor, Dried Tomato Pomace, Dried Beet Pulp, Salmon Meal, Carrots, Duck, Brewers Dried Yeast, Salmon Oil (Preserved with Mixed Tocopherols), Dried Egg, Salt, Potassium Chloride, Vitamins (Vitamin E Supplement, Niacin, Thiamine Mononitrate, D-Calcium Pantothenate, Vitamin A Supplement, Pyridoxine Hydrochloride, Riboflavin Supplement, Vitamin D3 Supplement, Vitamin B12 Supplement, Folic Acid, Biotin), Choline Chloride, Taurine, Minerals (Zinc Proteinate, Zinc Sulfate, Ferrous Sulfate, Iron Proteinate, Copper Sulfate, Copper Proteinate, Manganese Sulfate, Manganese Proteinate, Calcium Iodate, Sodium Selenite), L-Carnitine, Spinach, Dried Kelp, Parsley, L-Lysine Monohydrochloride, Cranberries, Yucca Schidigera Extract, Citric Acid (Used As A Preservative), Rosemary Extract. .